Finally got around to doing another run. I've been trying to get ahold of the larger 3mx1.5m sheets but been stuffed around so have used smaller sheets. It cost me more to use smaller sheets as I can cut as many on them. But anyway if anyone is interested they be ready to start shipping out next week potentially 1/3 of this run are already sold. What is the going $$$ + shipping to postcode 2233? I have not got an oven yet but it’s on the list of things lol. Well the oven trays arrived today. Again a big thanks Rory. Bloody hell Rory! Received my oven tray today and really, it is too good to use! I don't know what I was expecting but certainly not a tray stronger than an armoured car and better quality control than a....well I wish there was a 4WD built with such care. Hi Pubski, I would like to order 2 large trays. No rush I'm still waiting on my oven. Can i please order 2 small trays. Sorry guys at the moment I have no small trays left. I'll see if I can knock out a few to cover you guys. Usually they're no super popular so I don't carry much stock. Its best if your after some to pm me as Ill get notified when someone does i hadn't checked this thread as often. Thanks Pubski, got my trays today and over the moon with the quality of workmanship. 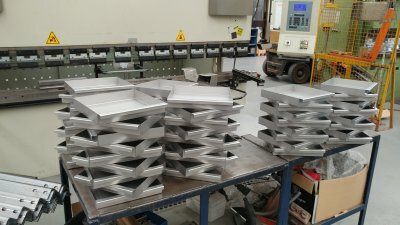 What are the dimensions of these trays (big and small).